Sabarimala, January 14: Thousands of Lord Ayyappa devotees Monday witnessed the auspicious 'makaravilakku', the ritualistic 'deeparadhana' (aarthi) held at Ponnambalamedu, the hill facing the shrine, as part of the annual festivities. Braving heavy rush, the pilgrims queued up for hours to have a glimpse of Lord Ayyappa, carrying the 'irumudi kettu' (the traditional bundle a devotee brings to the shrine) over their heads. The 'sannidhanam', the temple complex, reverberated with Lord Ayyappa hymns as the portals of the sanctum sanctorum was thrown open for the 'deeparadhana' in the evening, which was performed to the idol of the deity, adorned with holy jewels 'thiruvabharanam'. The jewels were brought here moments before the 'aarthi' in a ceremonial procession, which started its journey on January 12 from the Pandalam palace, where, according to legend, Lord Ayyappa had spent his childhood. Makaravilakku Mahotsavam 2019 at Sabarimala Temple Live Streaming: Watch Live Telecast of Makara Jyothi on TV9 and DD National. The devotees burst into chants of 'swamiye saranam Ayyappa' as the 'makaravilakku', the bright flame, was sighted atop Ponnambalamedu hill, located around 8 km from the shrine, as part of the ritualistic 'deeparadhana' held by tribals. The lighting of the flame by the Kerala government, with the support of the Travancore Devaswom Board and the forest department, at Ponnamabalamedu, is a continuation of the practice followed by tribal families who live near the hilltop. Makaravilakku at Sabarimala 2019 Date: Rituals, Customs And Traditions Attached to the Annual Festival Held on Makar Sankranti. Devotees occupied different points in and around Sabarimala hours before the ceremony began to have a glance of the 'makaravilakku'. 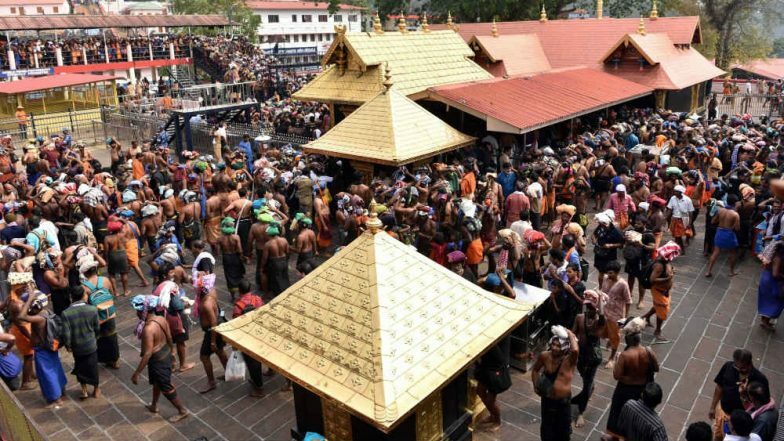 Unlike previous days, thousands of pilgrims trekked the holy hills Monday to take part in the makaravilakku festivities, which marked the culmination of the over two month long Sabarimala pilgrimage. Police and other agencies had made elaborate arrangements for the smooth conduct of the final leg of the pilgrimage and to manage the overflowing number of devotees, mainly from Andhra Pradesh, Telangana, Tamil Nadu and Karnataka, besides Kerala. Since the shrine opened for the Mandalam-Makaravilakku festivities on November 17, the Ayyappa temple had witnessed massive protests by devotees and right-wing outfits against the state government's decision to implement the Supreme Court's September 28 verdict, opening its doors to women of all ages to offer prayers. Traditionally, girls and women in the menstruating age group of 10-50 years were barred from offering prayers at the shrine, the presiding deity of which is "Naishtika Brahamachari" (perennial celebate). According to police, three women of menstruating age have so far offered prayers at the hill temple during the season. The hill shrine would be closed on January 20.